LEBANON, Ohio – June 22, 2015 – A tenth of a second isn’t very long. It’s about the same amount of time it takes someone to blink, or to form the first part of a word when speaking quickly. A little more than a tenth of a second — 0.169 to be exact — was all that was between Doran Racing’s #14 Nissan 370Z and victory in the Continental Tire SportsCar Challenge race at Watkins Glen International in Watkins Glen, N.Y., last June. That runner-up finish was the team’s best result of the year. The Lebanon, Ohio-based team will do its best to finish one spot higher when it returns to the Glen for this year’s race this Saturday afternoon, June 27. The competition is certainly tough. Any race that generates a margin of victory of only 0.169 of a second after two and a half hours of competition is very hard to win. But that’s what happened last year after 62 laps of the 11-turn, 3.4-mile road course were made during that time span. Doran Racing certainly has momentum on its side. The team is coming off a podium finish of third at the series’ most recent event, which was held May 2 at Mazda Raceway Laguna Seca in Salinas, Calif. It was just 0.284 of a second behind the second-place finisher in that race. 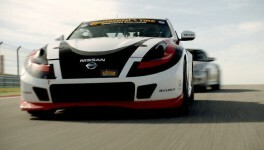 In both cases those results were produced by the team’s #14 Nissan 370Z, which advertises Nissan’s popular GT Academy. Its drivers are Brad Jaeger of Charlottesville, Va., and B.J. Zacharias of Cincinnati. Two Nissan GT Academy champions, Nick McMillen of Salem, Ore., and Steven Doherty of Plainfield, Ill., will be behind the wheel of the team’s sister car, the #41 Nissan 370Z, in the Continental Tire 150 at the Glen this year. Doherty ran a Skullcandy Nissan Altima in the Street Tuner class at the Glen last year with Bryan Heitkotter co-driving. McMillen will be making his first start at the Glen. Two 45-minute practice sessions are slated for 3:10 p.m. on Thursday and 8 a.m. on Friday before the Grand Sport class qualifies at 1:30 p.m. Friday. The green flag is scheduled to drop on the race at 12:25 p.m. the next day. The race will be available live on IMSA.com. It will also air at 10 a.m. on Sunday, July 5 on Fox Sports 1. 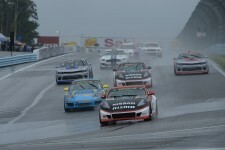 Following the Glen, the next CTSCC event is July 11-12 at Canadian Tire Motorsports Park in Bowmanville, Ont. Brad Jaeger: “If we can get some long green-flag runs, we can win at Watkins Glen. It’s a very good track for the Nissan 370Z. Kevin [Doran] also has a lot of success there with his set-ups and his race strategy. It’s always been a good track for Doran Racing. “B.J. and I both love to race at the Glen. It’s a challenging track with great history. We will need to stay out of trouble and try our best to be there at the end. We finished second at the Glen last year, which was our best finish of the year. B.J. Zacharias: “I’m looking forward to keeping up the momentum of Laguna. “Overall I’m very happy with our race pace through the first couple races of the season. I just think its tough with all the long breaks. Hopefully now we just keep it going. “We all need to keep our heads down like we have been, and keep moving forward. “Nissan has had a lot of exposure this year with all their programs, and we are delighted to be part of it. “Having Nick and Steve for Watkins Glen will be great for the 41 car. Nick McMillen: “As with all the tracks on the list this year, this will be a new experience for me lapping Watkins Glen for the first time. The Glen has such a rich history, holding events from Formula One to NASCAR over the years. The No. 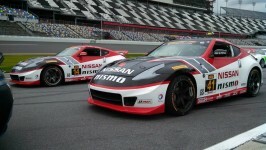 14 car finished second here last year, proving a strong pace for our Nissan 370Z, which is always enticing. I’m excited to get back in the car with Steve Doherty and see if we can make our way to the top! “I think my main challenge will be learning a new track quickly and getting up to pace. With three races in the Doran car so far, I feel pretty confident in the car as well as my ability. I believe we have a very strong car and driver combo to be competitive here at the Glen too. We will need to run a quick and consistent pace without over-driving the car, as we run very well in the longer stints. (On testing at the 24 Hours of Le Mans):“My opportunity to go testing at Le Mans was definitely a highlight of my short career so far. I got to run around 20 laps in a Ginetta/Nissan LMP3 car to qualify myself for future Le Mans races. Steven Doherty: “The goal for the Glen weekend is a podium! Coming off some unfortunate luck at Laguna, I’m looking forward to some good luck and a good result! “Last year we had our second-best qualifying run of the year at the Glen, but due to a technical issue we ended up starting at the rear. We had a great run but ended up running a half-lap short on fuel!